In this San Francisco (SF) News, California Pacific Medical Center today said that it was committed to not only building, but operating a new hospital at St. Luke’s Medical Center Campus. Last week, three members of the Board of Supervisors held a press conference essentially implying that the California Pacific Medical Center, or CPMC, would spend $300 million just to close the same facility. “The very premise—that CPMC would spend $300 million to build a new St. Luke’s, only to close it immediately—is absurd. If the supervisors desire additional clarification on the proposed Agreement, we will gladly meet with them. However, they rushed to hold a press conference based upon discarded draft documents that were dumped in the recycling bin. This was neither appropriate nor helpful. The drafts were a small part of our examination of many possible financial scenarios. Just like all responsible organizations, we examine optimistic and pessimistic assumptions, as well as ones in-between. The discarded draft documents came from very pessimistic scenarios that were rejected by CPMC’s management,” the hospital wrote in a letter to Mayor Lee that the CPMC sent this morning. I want to reiterate and reconfirm California Pacific Medical Center’s commitment to honor the Development Agreement negotiated with your office and approved by the Planning Commission on April 26, 2012. This includes our commitment to build and operate a new hospital at our St. Luke’s campus. The press conference this past week by three members of the Board of Supervisors appears to have misled and confused the public about our written commitment to the City and all San Franciscans to build new hospitals at St. Luke’s and at Geary and Van Ness. 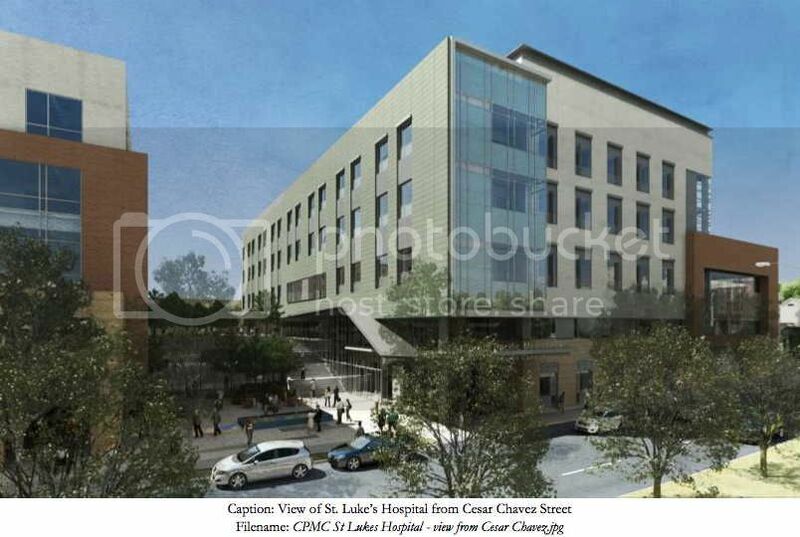 The very premise—that CPMC would spend $300 million to build a new St. Luke’s, only to close it immediately—is absurd. If the supervisors desire additional clarification on the proposed Agreement, we will gladly meet with them. However, they rushed to hold a press conference based upon discarded draft documents that were dumped in the recycling bin. This was neither appropriate nor helpful. The drafts were a small part of our examination of many possible financial scenarios. Just like all responsible organizations, we examine optimistic and pessimistic assumptions, as well as ones in-between. The discarded draft documents came from very pessimistic scenarios that were rejected by CPMC’s management. As you know, CPMC shared with your staff our Board-approved 10-year plan, which projects that the operating margin trigger will not be breached. Projections by their nature cannot be guaranteed because the future is unknowable. That is why it would be irresponsible for CPMC to promise to keep any of our hospitals open without regard to our financial situation. For that reason, CPMC has never represented that the operating covenant is “iron-clad” or that the operating margin could not conceivably be breached. However, the proposed development does provide iron-clad mechanisms for the City to monitor and ensure compliance. If the operating margin remains below 1% in the following year (for a total of two fiscal years in a row), CPMC will provide detailed financial information to the City for its independent review of whether the operating margin was indeed below the threshold. Only at that point could terminating the operating commitment for St. Luke’s be among the considered options. As an added measure of assurance, if the City disagrees about whether the 1% margin was breached for two consecutive years, the City may elect to arbitrate the issue, including the preparation of a third-party report. Finally, a CPMC default of our obligation to operate St. Luke’s in accordance with the operating commitment would expose us to significant liquidated damages to the City in the amount of $30 million a year. These strong, real, and verifiable protections for the City are in addition to our annual monitoring and reporting requirements, and the City’s rights to monitor compliance with all of our other healthcare and community commitments. We understand that some have concerns as to whether other aspects of the Development Agreement are sufficient. We believe they are. We would be pleased to talk to you and your staff about them to ensure this project, vital to the future healthcare of all San Franciscans, moves forward. CPMC’s $2.5 billion plan to build two state-of-the-art, seismically safe hospitals for San Francisco is a significant public benefit to the City’s healthcare network. We will double the number of seismically safe hospital beds in San Francisco and provide $1.1 billion in community benefits as part of the Agreement. The Agreement also includes our commitment to provide $86 million per year for 10 years for service to the poor and underserved; care for 10,000 new additional Medi-Cal beneficiaries; and provide $20 million to create a Community Care Innovation Fund to support community clinics and other social service organizations. CPMC has agreed to invest $62 million in affordable housing and subsidies, and to contribute $5 million for BRT on Van Ness and Geary, $20 million directly to the MTA, and another $13 million for pedestrian safety in the Tenderloin and other neighborhoods near these new hospitals. We know of no other hospital in the country that has agreed to such substantial benefits. Please also remember that, as a matter of law, St. Luke’s will have to close if we do not secure approval to rebuild it, which we can only afford to do if we are permitted to rebuild our other facilities as well. That is why we are taking this opportunity to clarify recent events and our strong commitment to the Development Agreement. This project has been in planning for 10 years. We have held hundreds of community meetings and have participated in 29 public hearings before the San Francisco Health Commission, Planning Commission, Board of Supervisors, and various other City departments and committees during the past 7 years. We must not let a last-minute false attack destroy a decade of work designed to protect and preserve healthcare in San Francisco. While opponents of our project have the luxury of feigning concern about what might or might not happen in the distant future—in the year 2030 or even 2035—we have real obligations in the here and now. CPMC is bound not only by the moral imperative to provide safe facilities in the event of the next significant earthquake, but by State requirements. Delay is not an option. The time to rebuild our hospitals is now. We are ready to break ground this year. Thank you for your continued leadership and for understanding that Rebuild CPMC is vital to our City’s future health. Be the first to comment on "SF News: California Pacific Medical Center Committed To Operate St. Luke Hospital"